Citrus, custard apples etc., protected crops, atriums. Small lady beetle with orange head with black wing covers. Lays up to 500 eggs per female. 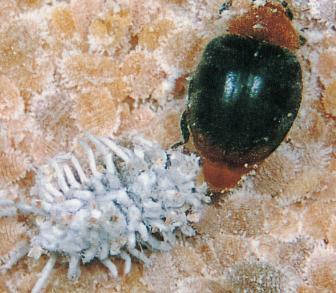 The larvae (not to be confused with mealybug) and adults feed on mealybug eggs and nymphs. Cryptolaemus are sold as adults in small punnets each containing 40 beetles. 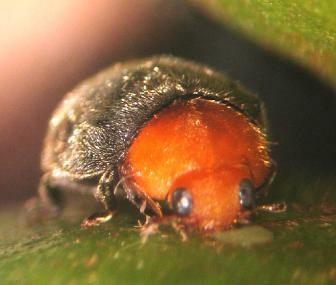 Sprinkle adult beetles onto foliage near mealybug infestations. Protected crops: 1-2 beetles per square meter. Outdoor crops: 1,000 to 2,000 beetles per hectare. Or view or download a PDF file of the Book entry for Cryptolaemus.